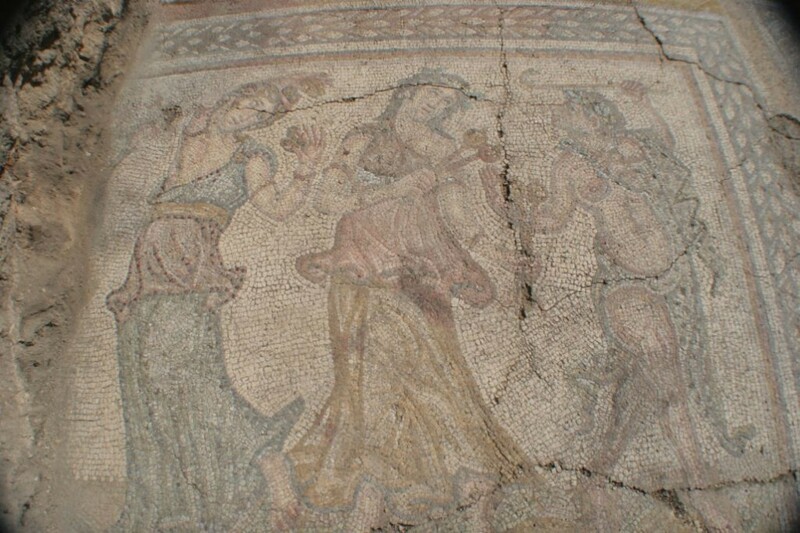 The Regional Museum of History in the southern Bulgarian city of Stara Zagora has unveiled for the first time a restored 4th century AD mosaic found in the ruins of the Ancient Roman city Augusta Traiana which depicts a “Dionysus’s Procession". The Dionysus’s Procession mosaic has been shown to the media and the public at a special ceremony in the Stara Zagora Regional Museum of History, four years after its discovery in Augusta Traiana back in 2011 because of its really complex and time-consuming restoration, reports the website of the Stara Zagora District Governor. 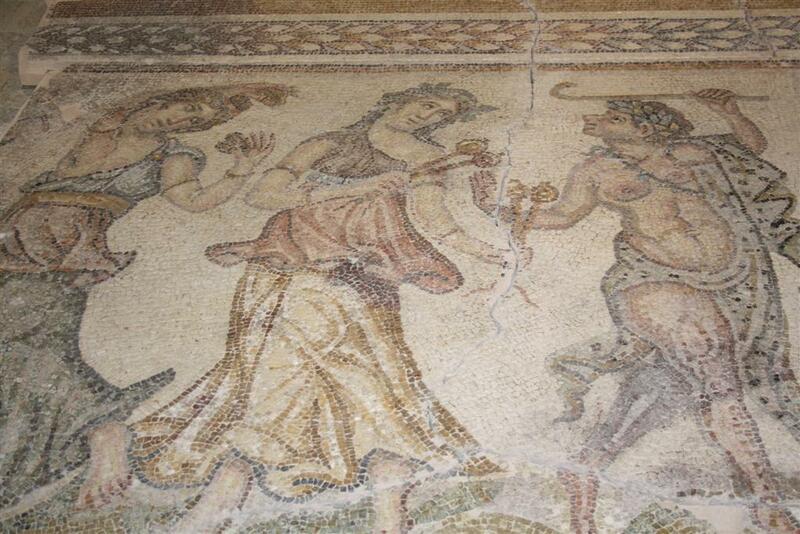 The mosaic does not show ancient god Dionysus himself but, rather, part of his entourage including some of the participants in his Bacchanalia: Silenus, who, according to Ancient Greek mythology, was a tutor and companion of Dionysus, leading two dancing women, or “bacchantes" (i.e. followers of Bacchus (Dionysus)). The Dyonysus’s Procession mosaic was found during rescue archaeological excavations in the northern part of the Ancient Roman city of Augusta Traiana, close to its fortress wall. The archaeological excavations in question were conducted in three consecutive years – from 2009 until 2011. The mosaic decorated a room which was probably a triclinium – a formal meeting and dining room in a Roman building. The triclinium was 10.1 meters long in the east-west direction but the archaeologists have been unable to find out its precise width in the north-south direction. The mosaic has a total area of 30 square meters. The mosaic depicting a Dionysus’s Procession consisting of Silenus and two bacchantes is very colorful featuring five different nuances of blue as well as several nuances of red ranging from pink to dark red. The ancient artist who created it with the opus tessellatum technique was also very skillful in using shades, especially visible in the folds of the bacchantes’ clothes. Based on the archaeological layers of Augusta Traiana discovered during the excavations, the mosaic of Dionysus’s Procession is dated to the third quarter of the 4th century AD, possibly during the reign of Roman Emperor Julian Apostate (r. 360-363 AD). The Director of the Stara Zagora Regional Museum of History Petar Kalchev and archaeologists Dimitar Yankov and Maria Kamisheva who found the mosaic in 2011 have described it as an exceptional piece of Roman art. They have explained that the mosaic floors in the homes of Roman patricians emerged at the beginning of the 4th century AD – a period when the Roman cities received strengthened fortress walls against barbarian invasions, the ancient pagan temples were destroyed, and the first Early Christian churches were built. The Dionysus’s Procession mosaic has been restored with funding from the American Research Center in Sofia and the America for Bulgaria Foundation, Sofia-based NGOs. As “Dionysus’s Procession” is just one of a number of Ancient Roman mosaics discovered during the excavations of the city of Augusta Traiana, Stara Zagora Municipality and the District Governor’s Office have committed to helping the Stara Zagora Regional Museum of History find a new place which will be used specially for the permanent exhibition of the mosaics. It saw its greatest urban development later under Roman Emperor Marcus Aurelius (r. 161-180 AD). It quickly became the second most important city in the Roman province of Thrace after Philipopolis (Trimontium), today’s Plovdiv. The Roman city of Augusta Traiana covered a territory of about 500 decares (app. 125 acres). During the Late Antiquity, it was visited by several Roman Emperors including Septimius Severus (r. 193-211 AD), Caracalla (r. 211-217 AD), and Diocletian (r. 294-305 AD), which is seen as a testimony to its importance. In the 2nd-3rd century, Augusta Traiana minted its own coins (a total of 874 of them have been found, as of 2016); it is known to have had commercial contacts with faraway regions and cities such as Sparta, Aquincum (today’s Budapest in Hungary), and the province of Syria. In the middle of the 4th century, Augusta Traiana became one of the major Early Christian centers in the Balkans. In the Late Antiquity (4th-6th century) the city of Augusta Traiana was once again known under its original Thracian name of Beroe. Much of it was destroyed by barbarian invasions – by the Goths in the 4th century, the Huns in the 5th century, and later by the Avars, Slavs, and Bulgars. The invasions of the Bulgars and Slavs in the late 7th century, around the time of the two peoples formed the First Bulgarian Empire (680-1018 AD), effectively ended the life of the Ancient Thracian and Roman city of Beroe / Augustra Traiana as it was. It became part of Bulgaria under Khan Tervel (r. 700-718 AD), who called it Boruy. The city was a major bone of contention during the numerous wars between Bulgaria and Byzantium and became known as Vereia after Byzantium conquered the eastern parts of the First Bulgarian Empire in the late 10th century. Bulgaria reconquered it during the early years of the Second Bulgarian Empire (1185-1396 AD). In addition to its Neolithic, Ancient Roman, Byzantine, and medieval Bulgarian heritage, the territory of the city of Stara Zagora is dotted with Ancient Thracian archaeological sites, including more than 30 known temples of the main god according to Thracian mythology, the Thracian Horseman. The Stara Zagora Neolithic Dwellings Museum is part of the Stara Zagora Regional Museum of History. It features what are described as “Europe’s best preserved homes from the early Neolithic period". It is based on discoveries made at a Neolithic settlement in the western part of the city dating back to the 7th-6th millennium BC first excavated in 1969 during rescue digs. In addition to the best preserved in situ early Neolithic dwelling in Europe, the museum also features an exhibition of prehistoric art. Problem here with editing or translation. The term “bacchanal” is used to refer to the ecstatic worship of Bacchus. The participants are referred to as “bacchantes”. Thanks a lot for pointing out this mistake!